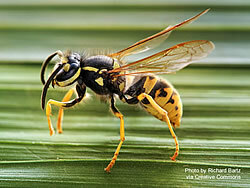 There are a number of wasps that are commonly referred to as "yellow jackets." The ones we get in Birmingham and elsewhere in Alabama are usually Vespula germanica, also known as the German wasp or European wasp. Yellow jackets are very aggressive. If they feel threatened, they attack with every bit as much gusto as hornets; but they tend to be slightly less wary and usually won't attack unless you get fairly close to them. They usually build nests of paper inside wall and ceiling voids, roof soffits, and other protected areas. 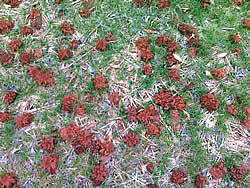 Yellow jackets' nests may be quite a distance away from the entry holes, and finding them can be a bit of a challenge. We use everything from stethoscopes to infrared cameras to find their nests so they can be treated directly, which is the most sure-fire way to kill a yellow jackets' nest. 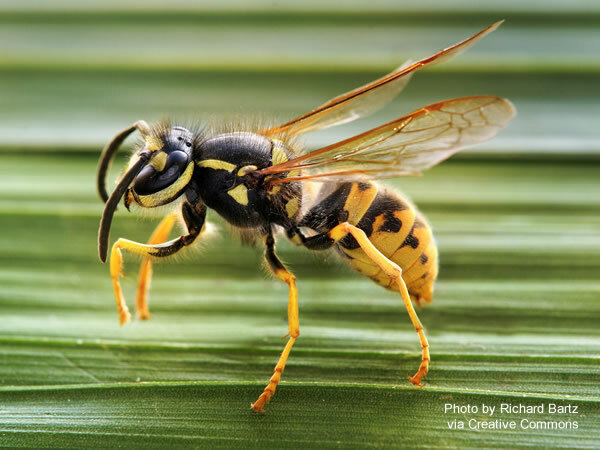 Although they are somewhat less aggressive than hornets, yellow jackets can still attack in great numbers, so they're really not something you want to treat on your own. It's also difficult to locate and treat their nests, so you're really better off calling a professional if you have a yellow jacket problem. "Paper wasps" is a catch-all term that we apply to wasps who build exposes nests made out of paper. There are many species, and they come in a variety of shapes, sizes, and colors to suit any decor. Paper wasps build open nests made of of paper that they make themselves, attached to semi-protected vertical or horizontal surfaces and attached with glue that they also make themselves. They're often found under porch roofs, around door and window frames, under the overhangs of houses and sheds, and in other open, but semi-protected places. Most paper wasps are solitary, although it's not unusual for them to live in close proximity to other paper wasps. Most species are also relatively non-aggressive. They won't hesitate to sting you if you give them a reason, but otherwise they're usually willing to co-exist in peace. The biggest objection to paper wasps is usually that their nests are unsightly and may stain or damage painted surfaces. Stings are also possible, and people who are allergic to insect stings should promptly arrange for treatment if they see any stinging insects on their property. Digger bees are solitary bees that lay their eggs in the soil. They care for their young until fall, when the adults die and the young enter the pupal stages within their holes. They spend the winter in pupation, and emerge as adults in the spring. Although they are solitary bees, digger bees usually build nests in the same areas as other digger bees. 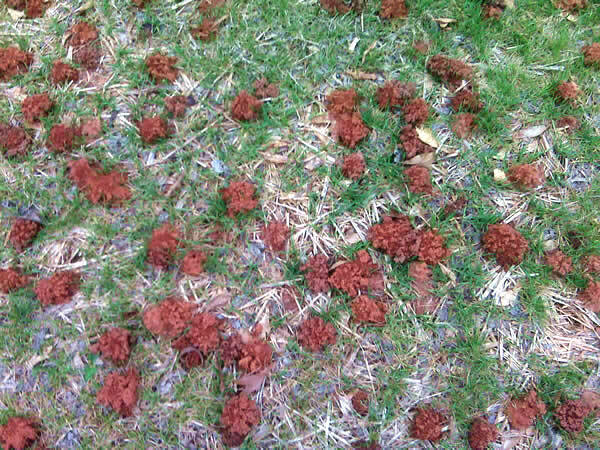 This can make it seem like a "colony" of bees has taken over your lawn, but in reality the bees have no social structure and the separate nests are not related. They simply are living in the same area, probably because the characteristics of soil, sunlight, and available food are of liking to them. Digger bees are not very aggressive and usually won't bother you unless you directly threaten them. But they do sting on occasion, and their stings can cause serious allergic reactions in sensitive people. Digger bee control is usually accomplished using liquid or dust insecticides depending on the situation and weather. For more information about honeybee removal or any of our quality services, please call us today for an on-site inspection and consultation. Had a good day yesterday!!! Quoted several houses in the Birmingham area with gray squirrels. Got a couple squirrel quotes in Birmingham today. Then off to Pell City to quote a customer with bats in their game room, attic, and walls. Feb 12, 2019 08:08:55 am. Heading to Birmingham to quote a house with squirrels in the attic. Then off to pick up some rats in Homewood. Couple more squirrel quotes in Birmingham. Jan 24, 2019 08:47:16 am. 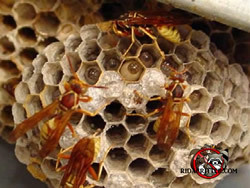 The Birmingham, Alabama office of Rid-A-Critter provides wasp and yellow jacket control in Birmingham, Alabama and the the entire Metro Birmingham area including Anniston, Bessemer, Brighton, Chelsea, Fairfield, Heflin, Homewood, Hoover, Hueytown, Irondale, Jasper, Leeds, Midfield, Moody, Mountain Brook, Oxford, Pell City, Trussville, Valdosta, Vestavia, and their surrounding areas.